This works great for Dropbox because they have a product which they can easily make more useful in a granular fashion: just add more space and stir. The cost of the marginal space is truly miniscule as a cost of customer acquisition: a few pennies a month if the user actually fills it, and most will not. However, the passionate freebie seeking techies in the audience will use their disproportionate-sized online megaphones to scrape another few gigs out of their account. So I decided to test out a version of this for Bingo Card Creator. 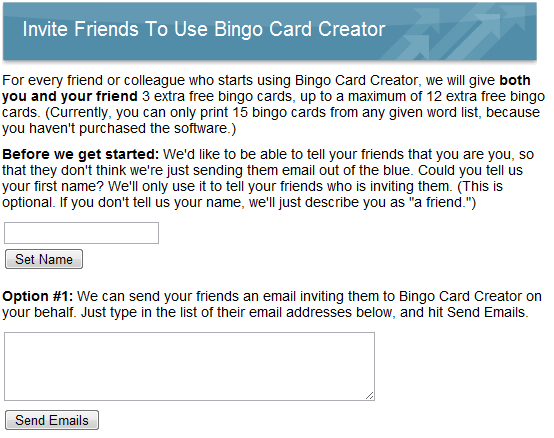 Historically, I have given free trial users 15 bingo cards for free. (This neatly segments my markets between parents, who very rarely have 16 children, and teachers and professional users, who rarely play bingo with under a dozen players.) I’m allowing them to invite friends: each successful invite gives both parties 3 extra cards, with a cap at 12 gained from inviting. This theoretically will allow a large portion of my core customer base to get their program for free, but I think that paying is ridiculously more efficient for most of them, so it will only be the truly inveterate skinflints who sign up four of their closest friends so that they can get 27 cards for class. The cost of allowing users to print extra bingo cards is, of course, too low to measure. All in all, it took a solid day. My gut feeling (yeah yeah, A/B test incoming) is that users will be overwhelmingly more likely to respond to an invitation from Jane than from jsmith@example.com or from “a friend.” So I asked customers to provide it if they haven’t already. It is totally optional but I’m thinking they’re overwhelmingly going to comply. I hit the social proof fairly hard on the signup page: mentioning again that Bob or whomever sent the invitation, and that both Bob and the user will benefit from accepting the offer. This page could stand to be a lot prettier, and I could probably throw a testimonial in here somewhere… In this example, our generous inviting user’s name is Bingo. Recently, having spent far too much of my time playing Facebook games (market research, I swear!) and scouting out the ecosystem more, I’ve noticed something. One, a quarter of the female members of my family aged 30+ are currently sheering sheep, planting pumpkins, or throwing pigs at each other. Two, my friends seem to comment on things they share… a lot. Whoa. This whole Facebook thing might actually have legs. It turns out that getting folks to share links on Facebook is child’s play: one line of code that you can copy/paste. With a bit more work, you can customize the text Facebook will pull out of the page. I customized the text to include a strong call to action with added social proof, naturally. Facebook sharing: not just for blog posts. One feature that I particularly like about the Facebook option is that it only requires two mouse clicks from users (one to open, one to confirm — assuming they’re already cookied on FB), and it doesn’t require them to understand or recall email addresses. My users have enough problems remembering and managing their own email addresses — I don’t want to include a “look up Anne’s email address” step in the workflow. Here’s an idea ripped straight off of the better Facebook games: give folks an opportunity to share stuff right when they hit the wall. (Well, most of the Facebook games artificially construct the wall such that you have to share to get around it… but I’m not that tricky.) For example, if someone wants to print 22 cards and only has 15 quota, that would be a great time to remind them of the incentive. Who ever accessed the invite page. Who sent invites via email, and how many. Daily counts of all of the above. In addition to the obvious (testing to see if this actually works), I have a few ideas for how to improve this in the future. One obvious thing which I will probably not do is to ask folks for their webmail login details, grab their contact lists, and assist them in selecting folks to receive emails. That would be stupidly effective, but it teaches bad Internet practices (do not give your Gmail details to random websites!) and frankly I don’t want it to be that easy to send invites. We’ve all got that one aunt who has not figured out netiquette for Farmville and sends 14 lost kittens a day: I do not want to be her enabler. I’ll probably also work on placement of the offer to invite, copy on the invite page, invite email, and invitation signup page (including graphical design), and will do some much more sophisticated metrics on this if early results look promising. Your guess is as good as mine. 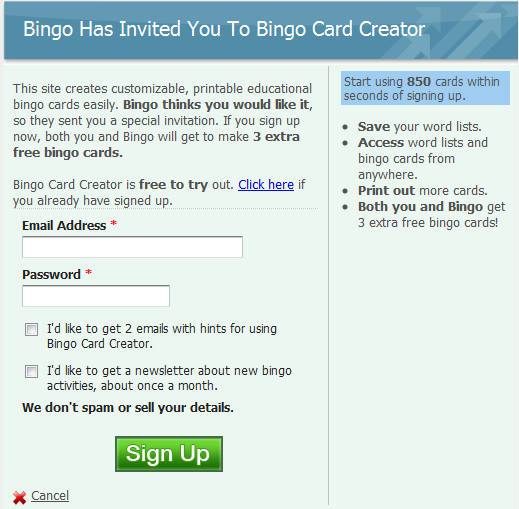 In favor of it working, most of my customers and many of my trial users are very thrilled with Bingo Card Creator. Many of them have figured out how to share it with friends despite me not giving them any good way to do so (not a trivial thing for elementary school English teachers — one bragged to me that she found out how to make a link to the website on her desktop and then bring it to her sister on a floppy, and if they’re getting over barriers to conversion that high, you know there must be something going on). There is also the natural penny-pinching nature of teachers operating in my favor — the fact that the program is not free is far and away my #1 user complaint — and the fact that they tend to travel in packs. In favor of the idea not working out so well: these are not very plugged in people as compared to Dropbox’s early adopter userbase, the actual mechanics of sharing still require non-trivial technical expertise (understanding email addresses and knowing those of your friends, for the option I’m giving highest billing to), and there are non-trivial business risks if it either becomes too popular or if folks feel that the invitation emails are an imposition. Speaking of which: I capped the number of invites I’ll send out per user at 5 (hard-capped at the moment), capped the number of invitations any individual will receive at 1, and have capped the system at a total of 500 a day until I have some idea of how many is safe to send. On the plate for tomorrow: figure out how I could have seen this one coming. My testing and staging environments simply ignore API calls to MailChimp for the obvious reason — I wonder if I should have them throw exceptions instead unless they’re explicitly expected behavior.